Scottish Scout has become Britain’s first Queen’s Scout of 2012 – the year of the Diamond Jubilee. artin Keane (19) from Greenock attended a special ceremony on New Year’s Day to receive his award – the highest that can be achieved in Scouting. Martin, who is in the 32nd Greenock and District Scout Group was informed just two days before Christmas that he had achieved his Queen Scout Award. Only a handful of Scouts receive this most prestigious award every year. 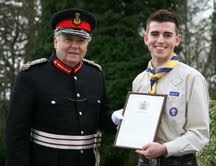 He received his Royal Certificates, signed by Her Majesty the Queen and his new insignia by the Lord Lieutenant of Renfrewshire, Guy Clark, at his Inverkip estate on New Year’s Day, making him Britain’s first Queen’s Scout of 2012, in this special Queen’s Diamond Jubilee year. District Commissioner David McCallum said: “This is a wonderful honour for Martin and everybody connected with the 32nd Scout Group in Greenock. To have his certificate presented on New Year’s Day in the Queen’s Diamond Jubilee is incredible. “I am particularly proud of Martin whom I have known since he was a Cub Scout. He has been a loyal member of the 32nd group for many years and has grown into a fine young man who is also a leader, all while studying at Glasgow University.” Carol McCallum, Group Scout Leader at the 32nd added: “I am delighted for Martin. He was a Cub Scout of mine and has ‘done his best’ over many years. I had a tear in my eye when his certificate was received. It was a very special moment.” Martin said: “This award is a great honour, especially coming as the first of the Queen’s Diamond Jubilee. “Throughout my time in Scouting I have gained all of the Chief Scout Awards and this is the culmination of many years hard work. On top of New Year’s Day I will also be invited to Windsor next year to meet a member of the Royal Family and I am sure that my award can help act as an inspiration to others to join the Scouts or help out in any way they can. It remains an excellent way for young men and women to learn real life skills.” Martin had to complete various tasks over a two-year period, including a gruelling 96km hike from Denmark to the site of the world Scout Jamboree in Sweden, where he gave up two weeks in the summer to be part of the International support team, assisting 40,000 from all over the world with various tasks. He also qualified as Kayak instructor as part of his award. Martin is a leader with his own Scout Group, which meets in St Patrick’s Primary School, Broomhill, Greenock. Two others from the same Group, brothers Matthew (20) and Dominic (18) Hurrell are also due to receive their Queen Scout Awards at a later stage in 2012.